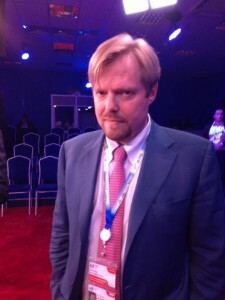 Yermolai Solzhenitsyn, Director, McKinsey & Company, Russia speaks to Daria Chernyshova of The BRICS Post at the SPIEF 2013. Question: How do you see Russia’s role in the BRICS and its trade relations changing focus from Europe towards China, for example? Solzhenitsyn: Russia certainly is eager to find ways to participate in the economic growth of the region, and there are several ways in which you can try to do this. The share of Russia’s trade with Asia is growing, although slowly. Today it accounts for 25 per cent of the total, four years ago – 21 per cent. I’d think about two different elements here. One is regional and cross-border economic activity. For example today we have the governor of Primorsky krai talking about how the Vladivostok economy is growing a lot because of its proximity with China and within a one hour flight from Vladivostok there are 400 million people – no other Russian city has that. So there is local growth. However, there is a demographic dis-balance as well. There can and should be more economic engagement in the investment of Asian companies into manufacturing in the European part of Russia – automotive and technology sectors. There is more and more interest in Russia as a demand centre. Asian companies could be part of competing well with Europeans and Russians for that market. Questions: What is Russia’s role in the BRICS? Solzhenitsyn: It is important to psychologically view yourself as part of different communities – it’s good and healthy for Russia to view itself as not stand-alone, but think of different configurations within which it can exist. All the BRICS countries can learn from each other, there are similar stages of development, how to tackle different challenges and certainly for Russia one of the most relevant examples coming from the BRICS – how do you actually go abut regional development, how do you go about setting up and planning effective infrastructure expansion programmes. Question: Do you think Russia can use the BRICS to diversify its economy? Solzhenitsyn: I wouldn’t connect the two. I think diversification is a separate topic. By the way, Russia should think not only about diversification of its economy horizontally, but think about more value added activity, using the resources we have. We should not be embarrassed of the mineral worth of Russia- we should be trying to use this. For example, Norway has a lot of hydrocarbons, and it developed one of the world’s leading oil field services industries. Russia certainly should be the world leader both in oil technology and services.